Summer Reading Flash Sale: all ebooks 50% off -- or more! 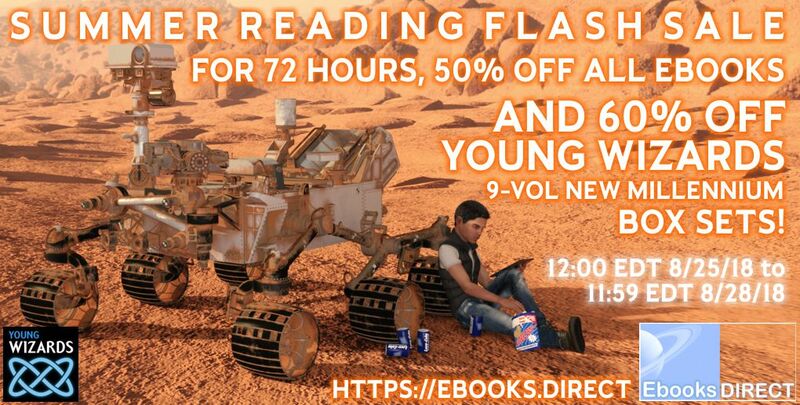 For the next 48(-ish) hours, we're holding a Summer Reading flash sale at Ebooks Direct! The store's whole inventory is at least 50% off -- including our newest items, such as the first Middle Kingdoms main-character fiction in 25 years, Tales of the Five #1: The Levin-Gad. And better still, our big-ticket items -- the Young Wizards New Millennium Editions 9-volume box sets -- are available, just for today, at 60% off. That's about $2.00 per ebook -- an incredible discount!